Choosing a musical toy for your baby is an important decision, so we have compiled a list of our favorite picks for babies of all ages. There are all sorts of different types of baby toys which play music, ranging from small toys resembling drums to large activity centers for babies to sit or stand behind. Here, we have selected a few of each type of musical toy and reviewed their features, to help you make the best choice. 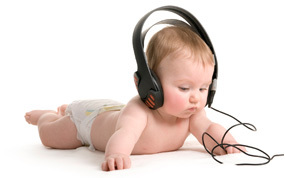 There are a few things you should think about when choosing a musical toy for your baby. The most important is to make sure that the toy you choose is suitable for your baby’s age and abilities. Choosing something which is too advanced may lead to frustration, and could even be dangerous. Think about the kind of toy you want to buy for your baby. You may want something small to take out and about. Or, you may be looking to make a bigger investment. In this case, choose an activity table which grows with your baby to give great value for money. It’s also important to think about safety when choosing a music toy for your infant. Make sure you choose a reputable brand known for producing quality goods. Choose a toy made from strong materials which are easy to clean and can stand up to being chewed on or thrown. If buying for a very young baby, make sure there are no small parts which could be swallowed. It’s also very important to make sure the battery compartment cannot be easily opened by your baby too. This cute and cuddly musical lion toy is perfect for babies from birth onwards. It can be used by even the youngest musician – simply shake the toy to hear the sounds. The lion toy is also great for helping stimulate babies’ senses. There are lots of exciting textures and patterns for them to look at and explore. The VTech toy is great for learning too – it tells you all about shapes, colors and the alphabet. This makes it great for older babies who are learning their first words. Babies and toddlers of all ages will love to look at their reflection in the mirror. 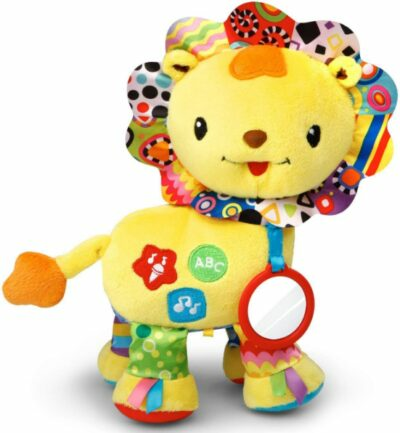 The musical lion toy features a handy hook on the top, making it perfect for on-the-go fun. There is a volume control on the toy, sure to please parents! Your baby will love to play with this toy and dance to the fun music it plays. This musical drum toy is perfect for 6 month old babies who can sit up. They will be able to use the toy independently and is perfect for playing with sitting at the table. There are three different modes of play, which can help teach your child about counting and colors, as well as playing music. 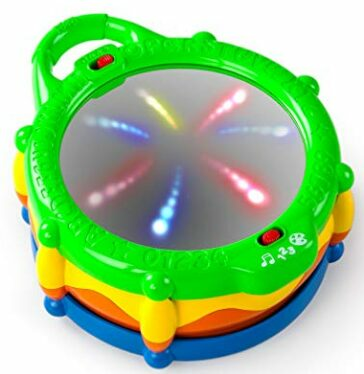 Babies will love to watch the fascinating display of lights produced as they hit the drum toy. They can also learn how to count using the beats of the drum. If the color mode is selected, the lights match the color, which helps your baby learn to match names to colors. The drum has a carry handle, so it’s ideal to take out and about. Your little one will love to show everyone how they dance to the fun music played by this toy! This is a great musical toy for babies of all ages – it grows with your child as their abilities develop. It is ideal to use with babies who are able to sit independently, as they can touch the bar to hear fun sounds and watch the lights. Once your baby is able to stand, they are encouraged to dance and move to the music and instrument sounds. Even if they can’t properly stand alone, the bar is perfect for supporting them as they cruise around. The toy is also great for young toddlers, as there is a mode which teaches about counting and letters. The interactive baby toy is really easy to operate, as it responds to touch rather than having buttons which are difficult to press. The light display is appealing to babies of all ages – play along to the games and they may see the whole bar light up. This is great for helping your baby learn, as they are rewarded in a fun way. All babies love to play with their parents’ keys, phones and remotes so this is a perfect toy to keep them safely away from your gadgets! Your baby will love having their own set of keys, and it plays a great selection of sounds and music. 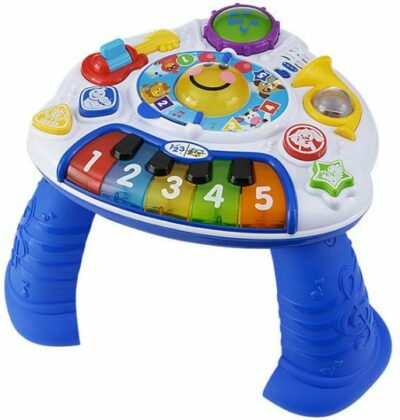 The musical keys are ideal for babies to use right from birth, and will continue to provide amusement into toddlerhood. The toy is small and portable, making it perfect to pop in your bag. It is great to use during teething too – it is just the right size for babies to hold and chew on. The VTech musical keys are great for improving hand-eye co-ordination skills, as well as helping with imaginative play. 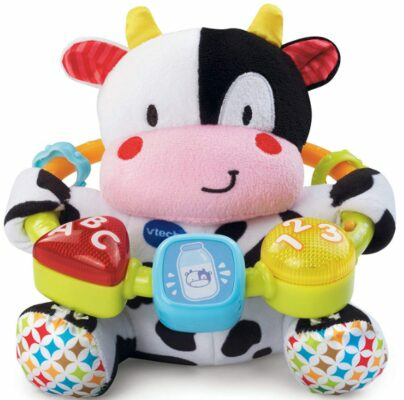 It automatically detects motion and starts playing, making it perfect for very young babies. It plays over 30 different songs and sounds, including car horn noises. This is a classic musical instrument for babies and toddlers. It is perfect for infants aged around 9 months and older. The cord is short enough that it prevents your baby from accidentally becoming caught in it. The short cord also means it’s harder to hit other things with the beater, and it will never get lost – features sure to please parents! Once your baby begins to walk, they will love to pull their xylophone around behind them. It is made of durable plastic, so it is sure to withstand some beating by your baby. The toy is great for improving fine motor skills as your baby learns to accurately hit the bars. It’s also great for developing hand-eye co-ordination. You can even use the xylophone toy to teach your baby the names of colors, asking them to hit certain ones. This activity table is great for babies aged around 9 months and older, or who can stand with support. It is great for teaching your child about different musical instruments and the sounds they make. The toy plays real sounds from a few instruments, and offers five classical melodies for your baby to listen to. The interactive baby toy offers three different languages, so you can get your baby used to hearing different languages at an early age. It also helps teach colors and counting skills in ‘discovery mode’. The flashing lights and colorful animal pictures are sure to appeal to both boys and girls. For younger babies, there is the option to remove the legs so baby can sit on the floor and enjoy the music. Once they are able to stand, simply slot the legs into place to encourage your baby to stand and strengthen their muscles. This cute, cuddly baby musical toy is great for newborn infants. There are a variety of textures for your baby to explore and enjoy, and they can cuddle up with the toy when they’re finished. The beads on this VTech baby toy are easy to grasp, so it’s perfect for young babies. The middle one spins for your baby to practise their motor skills. Other beads light up and play music, teaching your baby about letters and numbers. 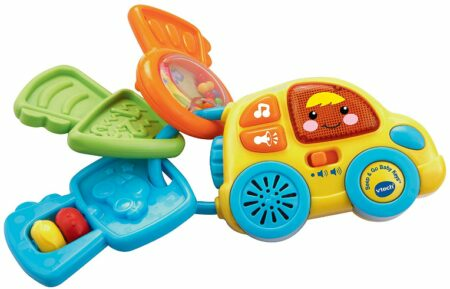 The noisy toy plays over 30 songs and phrases, sure to keep your baby entertained. The toy is perfect for carrying in the diaper bag – it is small enough to easily fit and sure to amuse your baby all the time. Older babies will love using this toy to learn in a fun, exciting way. This four-piece rattle set is perfect for 3 month old babies and older. 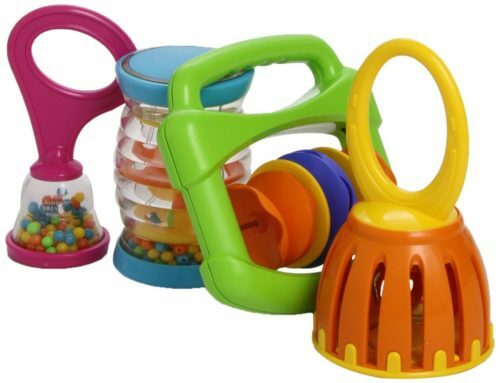 It includes different shakers and bells, sure to entertain your baby over and over again. The toy is made of great-quality materials which will stand up to years of heavy use. The toys are lovely strong colors – they will catch your baby’s attention for sure. The musical set comes in its own storage bag, and doesn’t require any batteries – sure to delight parents! The carry case also means the toy is perfect for taking out and about. Older babies and even toddlers will love to form a band with their friends using this great set. This musical book is perfect for babies aged 6 months old and above. The pages are easy for young babies to turn by themselves. The chunky, colored buttons are also easy for infants to press, and they will love to hear the musical instrument sounds. Your baby will never get bored with this musical book – it offers over 40 sounds and melodies. There is a lighting-up star which flashes to the rhythm, to keep your baby’s attention. 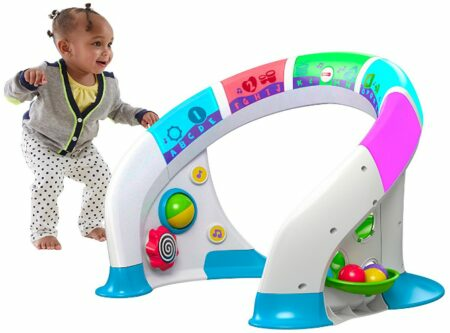 Older babies can use the learning mode to hear the names of colors and instruments. This fun, interactive book is great for taking in the car or in the stroller – it is easy for your baby to carry and can entertain them for a while! When the book is closed, turn it sideways to use the buttons as a piano for even more fun. For those who really want to get their baby the best musical toy, look no further than Fisher-Price’s Bright Beats Play Space. This toy is perfect for growing with your child from when they are able to sit, right until toddlerhood. It is great for encouraging your baby to become more active – they won’t be able to resist dancing to the fun music. If you are looking for a small music toy on a budget, the VTech Beep and Go Keys make the perfect choice. They can teach your baby about many different things and are a nice, portable size. The keys are great for teething babies too, making them really multi-functional. They’re an ideal gift for a baby, too. Parent’s have been giving their babies musical toys for hundreds of years now, from the wooden drums and flutes of the 19th century to the cool electronics we have today. The reason for this is that musical toys are great for babies development and helps them to progress in both intelligence and motor skills. Here are just a few examples of the benefits that musical toys will bring to your baby. Yes, you heard us right! Music and musical toys help to increase babies brain power. We won’t bore you with all the technical sciencey stuff, but basically by being exposed to music and playing with musical toys, babies learn to recognize and differentiate different sounds and patterns of sounds. They will eventual recognize different songs, instruments and notes, and all this makes for a brilliant work out for their little brains. Music stimulates a vast amount of the brain and different connections all over it, so don’t deprive your baby of developing these parts of their minds. Musical toys are great for babies to help them develop motors skills, spatial awareness and hand eye coordination. AS the toys will make sounds based on the babies actions, such as pushing buttons or hitting drums, they will love playing with them over and over again, and all these body actions are vital to your kids developing their motor skills and also learning about cause and effect. 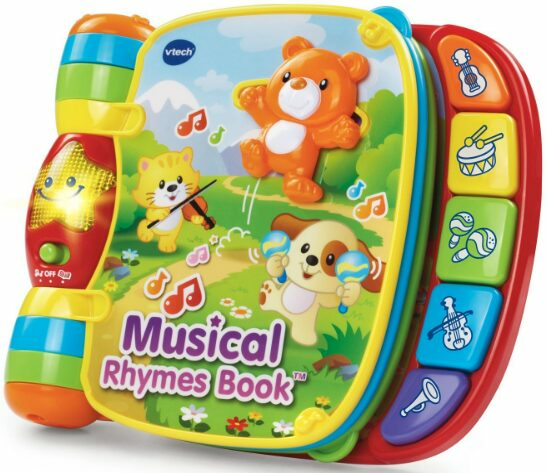 The simple rhymes and song lyrics that children learn through musical toys are wonderful for their vocabulary and development of language skills. Simple songs like ‘Twinkle Twinkle Little Star’ and ‘Itsby Bitsy Spider’ will form the building blocks of your baby’s vocabulary, and the bigger a child vocabulary the better reader they will become. Children will develop a sense of rhythm through clapping, drumming or dancing along with their musical toys. This helps them to be coordinated and develop strong links between their brains and their bodies, which in turn will help them out a lot in any physical activity they do, such as learning to walk, crawl, and more.